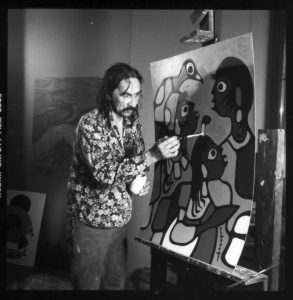 In July 1979, the McMichael was honoured to host Norval Morrisseau as artist-in-residence. For three weeks, Morrisseau worked in the Tom Thomson Shack where visitors could engage with the artist and see his painting process. He worked on sixteen paintings which were commissioned by the McMichael. The photographs on display here show the artist in the Thomson Shack, alongside the unfinished paintings Manifesting from Within Childlike Simplicity and Thunderbirds with Loons and Fish. These two paintings are on view here, along with other works from the 1979 commission: Shaman and Disciples and the two untitled floral paintings. Morrisseau was born at Sand Point Reserve near Beardmore, Ontario, in 1932. His maternal grandfather, Moses Nanakonagos, was an exceptional storyteller and was recognized as a shaman by his peers. Morrisseau (also known as Copper Thunderbird) began drawing the legends of his people at a very young age. He became a full-time artist in the early 1960s, founding the Anishinaabe School (also known as the Woodland School). His unique style influenced many artists including Daphne Odjig, Carl Ray, Blake Debassige, and Saul Williams. Morrisseau was appointed to the Royal Canadian Academy of Art in 1973 and presented with the Order of Canada in 1978. In 1986, he was acknowledged as a Grand Shaman of the Ojibwa. The 2006 retrospective Norval Morrisseau – Shaman Artist was the first major solo exhibition of a First Nations artist at the National Gallery of Canada; a little over a year later, the artist died.